Smaug's attack on the men of Lake Town. Since i read the Hobbit it was on my to-build list to try my hands on the iconic dragon Smaug. At least the Middle Earth Lego Olympics start, what gave me the last push. 3. It cannot be seen, cannot be felt, cannot be heard, cannot be smelt. It lies behind stars and under hills, and empty holes it fills. It comes first and follows after, ends life, kills laughter. Not only it's night, when Smaug comes from the Lomley Mountain to Lake Town, but in addition the dragon bring pain and destruction about the poor village. Burning homes, wounded and dead inhabitants. The whole build basically finished before i got the chance to watch the second Hobbit movie the first time, so the houses of Lake Town and Smaug are result of the description in the book and my own imagination. Next to fitting proportions and the general organic look it was important for me to realize the iconic gold belly. I hope everyone is fair enough not to spoiler anything from the new movie, because there are always a few people who didn't saw it yet. There is always a solution without Customs! This is awesome in so many ways: details, colors, scale, etc. Well done! Stunning Work! Love the Dragon - absolut great work on it! Perfect. Awesome attention to detail - I really liked the way you did Smaug's stomach. Awesome! Love the gold coins on his belly! A well deserved first placing in round one, looking forward to what youll bring in the elimination rounds! An incredible MOC! 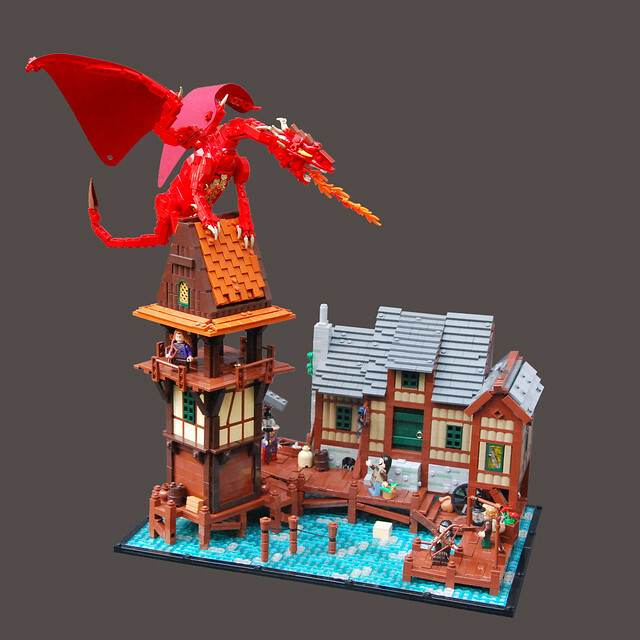 Lake town looks perfect, and the details on the dragon are simply genius! This is awesome! Smaug and the buildings are all perfectly done! Awesomeness. Great job specifically with the belly. Wow! The MOC is very nice, but what really impresses me, are the number of new techniques I have learned, just by wathcing this MOC from you! Nice smaug! liek the wings and belly a lot. Flawless creation with exceleent details. Smaug's golden belly is well done too. amazing, much better than original LEGO set "Lake town"
Fabulous work! Excellent details everywhere! Your Smaug is excellent! Good job! Lovely dragon you have there! Fantastic creation, every detail is perfect. Amazing! The building are just great! This is really neat! I like how you incorporated the official Hobbit Minifigures with ones of your own design. Spectacular build. Love the inclusion of gold pieces in the belly, it's the details like that which really make me respect the time you put into this. Brilliant stuff, hope your creations remain just as terrific in the new year. Excellent. I like the roofs. 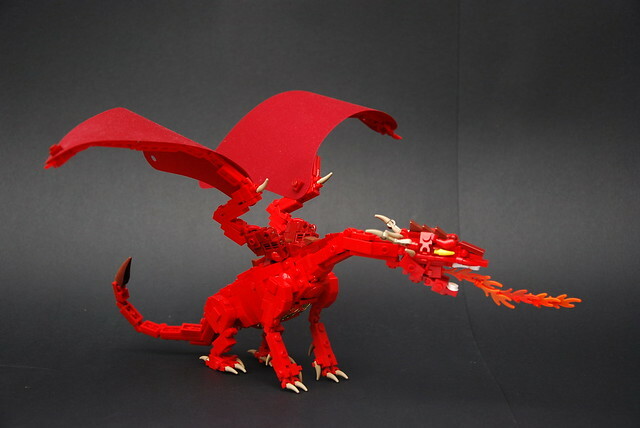 I love your Smaug, excellent job! Quite a treat; the attention to detail is evident. Outstanding job! Lake-town is flawlessly done, as is Smaug!The gold belly is an almost invariably overlooked detail, but you nailed it! The tiled roof of the tower looks great! Perfect! Just how I would have imagined Laketown just from reading the books. Smaug's gold stomach is a stroke of genius. A fantastic creation. The village has a lot going for it with wonderful details. Love the dragon. Especially the gold on the belly. Amazing design on the smaug and I see some cool techniques. The roofs looks great too. Smaug is really cool! Lake town is nicely done as well. Das sieht wieder mal super aus! Ich mag deine Details wie z.B. Die Leiter im Turm!! wow! superb scene! very detailed and imaginative! I wish it would say "I love it". There is so much that I wish I could build in this...I cant even say how much I love this. Well this is epic. Great timber work, and I love the dragons golden chest! Smaug's waistcoat is the best part - it's brilliant in more ways than one. There's nothing to critique; flawless build! O.o Well then... now this contest is stacked. Really Good job. Smuag looks great. Great stilts and roof slats! ....I'm...Speechless...Such an awesome build! Love Smaug, especially the way you got the gold in there...The buildings are great,and man are they accurate! Keep building Awesomely...I intend to build stuff this awesome...one day! Whoa, absolutely stunning! Incredible job!